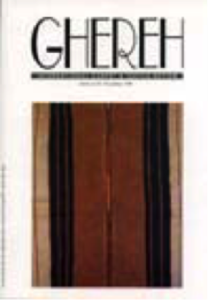 This is an illustrated version of an article published in the International Textiles journal, Ghereh in December 1996, looking at the Maudslay collection of late 19th Century Guatemalan Textiles at the Victoria and Albert Museum, London. Fig 5. Solola woman’s utility cloth from the 1960’s; cotton. Fig 7. 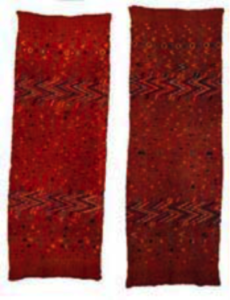 Left: Chichicastenango man’s headcloth from the 1950’s; silk brocading on cotton ground.Right:Man’s tzut 19th Century. Fig 8. San Martin Jilotepeque huipil from the 1980’s; cotton & acrylic;San Antonio Aguas Calientes huipil from the 1970’s. Fig 10. Patzun huipiles from the 1950’s with geometric silk embroidery (top); from the 1980’s with floral cotton embroidery. Fig 11. Salcaja cotton shawl from the 1960’s with simple ikat; silk shawl from the 1950’swith figural ikat and wool pompoms. Fig 13. Tecpan-over huipil from the 1960’s with natural brown cotton, and silk brocading. 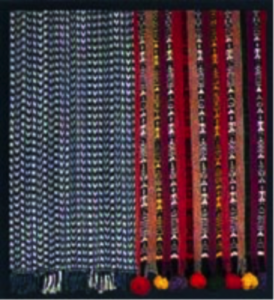 On February 17th (1996) the Victoria & Albert Museum opened its display of Maudslay’s Guatemalan Indian weavings, the first time this collection has been shown to the general public. Alfred Percival Maudslay (1850 – 1931) was an eminent scholar and archaeologist who made 9 visits to Central America between 1881 and 1894 to photograph, map and make casts of the Mayan architecture and artefacts he found there. In 1899 he and his wife published “A Glimpse of Guatemala”, the account of their 1894 travels. As many of the textiles he bequeathed to the V&A come from the villages he mentions in that account, it is tempting to date his textile collection from that time. However, we know that the loom he gave to the Cambridge Museum of Archaeology and Ethnography (endnote 1) was bought in San Antonio Palopó in 1885, an indication that he was visiting the highland villages and buying textiles from the very first. Indeed, as all the textiles show varying signs of wear, some may well have been woven in the 1870’s. A major frustration for those wishing to trace the development of Maya textiles from Pre Columbian times through to the 20th Century has always been the lack of material evidence. Apart from some tiny cloth remnants found at various archaeological sites (endnote 2) , no known examples of highland Maya weaving exist prior to Maudslay’s collection, although the Reverend Heyde followed close in his footsteps (endnote 3) . Hence the excitement at what in comparison to ancient Peruvian textiles, might be called very modern work. All the textiles in the V&A display with the possible exception of the shawl T21 were woven on the simple stick loom (also called a back-strap or hip-strap loom, Fig 1). 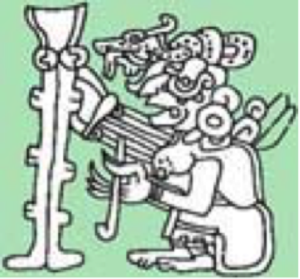 This pre-Columbian loom which appears in Maya sculptures and the Madrid Codex (Fig 2) is the loom still used most by women today to weave various items of clothing for themselves and their family . The foot loom (introduced by the Spanish conquerors) is used mainly to weave skirt fabric and trade items (endnote 4) . In contrast to his meticulous documentation of archaeological artefacts, Maudslay lumped all his textiles together under the simple title: “Guatemala, 19th Century”, without mentioning specific villages. The provenance of many (endnote 5) , however, will be recognised by Guatemalan textile enthusiasts conversant with Eisen’s 1902 collection (beautifully presented in “Maya Textiles of Guatemala” by Margot Blum Schevill), or Tulane University’s well documented 1925-1935 collections (endnote 6) . An important idiosyncrasy of Guatemalan Maya weaving is their tendency to be village specific, with weavers drawing on a communal repertoire of designs and colours. 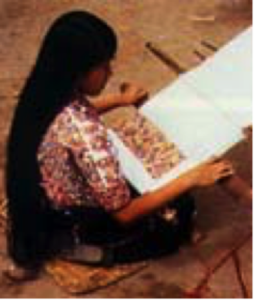 Whilst over the last decade it has become socially acceptable for indigenous women to either weave or buy items in the designs and colours of other communities, it is only recently that completely innovative huipiles (women’s blouses) have appeared which do not conform to any specific village style (endnote 7) . whether the cloth is plain, basket, or warp-faced weave and whether the brocaded designs are single or double-faced, all play an important part in village identification. Yet another stylistic factor that has tended to remain constant where huipiles are concerned, is how the textile is taken off the loom:- i.e. whether all 4 sides are selvedged, or whether one or both ends are cut and hemmed. The number of panels used to construct a huipil also conforms to the village style. All 13 of Maudslay’s Guatemalan textiles have cotton warps and wefts whilst the brocaded designs are worked in cotton, silk floss and wool, a ‘classic’ combination of threads that occurs on fine weavings through to the 1950’s. Acrylic began taking over from wool in the 1960’s (endnote 8) , and is today replacing cotton for the ground weave also. The reason weavers give for this dramatic switch of material is their preference for the brighter-coloured, fade-resistant yarn. The use of silk floss reached its zenith in the 1930’s after which time rayon and mercerised embroidery cottons became more popular because of lower costs and greater availability. Although synthetic dyes were invented in 1856, certain natural dyes such as cochineal, indigo and murex continued to be used well into the 20th Century. Carlsen and Wenger (endnote 9) have identified cochineal dyed silk floss in textiles T33 and T34, and in one of the Chichicastenango men’s head cloths (T31); the mauve silk used to stitch the Patzun huipil (T23) is also dyed with cochineal. Brocaded motifs in shellfish purple (Purpura patula) appear on both T33 & 34), and all the brown thread is undyed natural brown cotton (Gossypium mexicanum Tod.) which is always handspun. The blue cotton is most probably indigo or locally grown sacatinta (Hacobinia spicigera) as indigo wasn’t synthesised until 1880, and it took another twenty or thirty years for the German cartels to establish their monopoly of the production of synthetic indigo (endnote 10) . Fig 3. Huipil panels brocaded in silk and cotton. 19th Century. ©Victoria & Albert Museum, London. Carlsen and Wenger have established that between 1875 and 1927 red cotton thread was dyed with alizarin, and not cochineal, as previously supposed (endnote 11) . Alizarin used to be obtained from the roots of the Madder plant (rubia tinctorum) and was combined with various mordants to produce not only reds, but also violet, brown and black. In 1869, Sir William Perkin developed a process for manufacturing synthetic alizarin that made this cheaper to use than the natural dye. Alizarin continued to be used in Guatemala in diminishing degrees through the 1930’s and had disappeared altogether by 1940 (endnote 12) . The distinctive yellows and the grey-green are colours that appear on textiles through the 1930’s (endnote 13) . Tests show that they too are natural dyes, the green being a composite of indigo and yellow. Fig 4. Cotton tzut from Solola. 19th Century. In comparing Maudslay’s textiles with contemporary fashions in the same villages it is fascinating to note the changes that have taken place over the century. Indeed, in some villages the design change has been so radical that it is only by tracing the transitions that the piece can be identified. 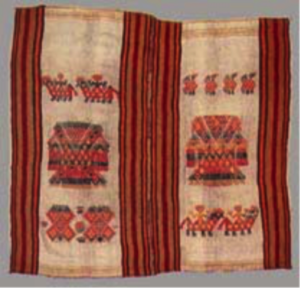 For example Sololá women’s tzutes (utility cloths or wraps T24, & T27 (Fig 4) gradually acquired more stripes, including simple block ikat in the mid 1930’s; then the dominant white, blue and brown fields were minimised (Fig 5) to be replaced by the bold figural ikat of the 1980’s and ’90’s. Very interesting changes have taken place with Chichicastenango textiles also. 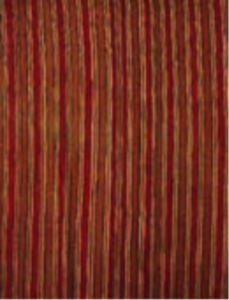 White ground servilletas (basket cloths) similar to T36 (Fig 6) and T39 with red, yellow or natural brown cotton side stripes and various brocaded motifs remained the norm through the 1920’s and ’30’s (endnote 14). In the 1940’s and ’50’s the white ground gradually gave way to overall coloured striped ground (endnote 15) (Fig 7). Today these brocaded servilletas have been largely replaced by brightly striped commercial utility cloths woven in acrylic. Right: ©Victoria & Albert Museum, London. The ground cloth of men’s head tzutes T326 and T31 began changing from white to red relatively early on: there are two examples in Eisen’s 1902 collection (endnote 16) , and four out of five tzutes collected by Samuel Lothrop in 1916/17 have red ground (endnote 17) . The large double-headed bird motif, brocaded in mauve silk floss on red ground cloth with black pinstripes, became the predominant motif of the 1930’s and ’40’s, gradually replacing the small animal designs. Photographs published in the National Geographic Magazine in the mid 1940’s (endnote 18) also show a shift from brocading in mauve silk to the distinctive maroon beloved of the Maxeños (endnote 19) who achieve this colour by over-dying mauve silk floss themselves. The double-headed bird motif gradually grew more abstract and from the 1960’s onwards began appearing as a series of colourful zigzags. At this time too a completely new design, i.e. European style flowers copied from embroidery books, became popular. An interesting phenomenon today is the resurgence of the older double-headed bird designs among young weavers; it is open to speculation whether this is due to an increasing pride in being Maya, or a response to market forces demanding ‘antique’ textiles with ‘traditional’ designs. Huipiles similar to Maudslay’s 2 panels T33 and T34, (Fig 3 – above) but on white ground, form part of Eisen’s 1902 collection and are provenanced to San Martín Jilotepeque. Interestingly, during recent field research women from both San Martín and San Antonio Aguas Calientes claimed Maudslay’s textile as their village work. Huipiles collected from these two villages in the 1920’s and ’30’s are far more elaborate than the early pieces and very similar in design, with continuous bands of zigzags, diamonds, dots and chevrons replacing the scattered motifs; the brocading threads are mainly silk floss and the ground cloth has changed to navy blue. Whereas the design of huipiles for San Martín Jilotepeque have remained more or less consistent from the 1930’s to this day (Fig 8), those of San Antonio Aguas Calientes began to change radically in the 1970’s, incorporating wide bands of floral and animal motifs copied from embroidery pattern books. Contemporary huipiles are almost completely covered in these exotic designs woven in a double-faced brocading technique which makes the item reversible. Fig 8. San Martin Jilotepeque huipil from the 1980’s; cotton & acrylic; San Antonio Aguas Calientes huipil from the 1970’s. Whilst the textiles of villages such as Chichicastenango, Sololá and San Antonio Aguas Calientes have undergone considerable design changes over the century, it is surprising how little the weavings of other communities have altered. The Patzun huipil collected by Elsie McDougall between 1928 and 1931 and the one drawn by Josephine Wood (endnote 21) between 1939 and 1942 are identical to Maudslay’s T23 (Fig 9), except for the narrowing of the white stripes, the inclusion of occasional green and yellow pin stripes and the decorative triangles embroidered round the appliquéed silk half-moon at the neck. Although through the 1960’s and ’70’s the embroidery round the neck became increasingly lavish (Fig 10.) and began incorporating European floral designs, photographs I took in 1983 show older women still using the simple style depicted by Wood. Fig 9. Patzun huipil 19th Century. Collected by Maudslay. V&A inv.no T23-1931 ©Victoria & Albert Museum, London. 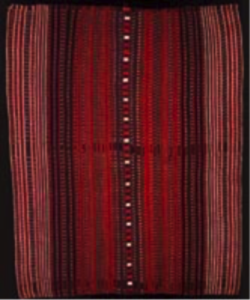 The same sort of continuity can be traced through shawl design in Salcajá. 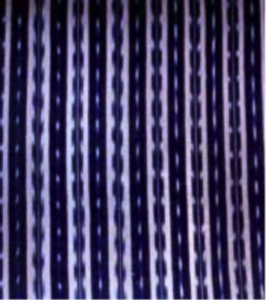 Maudslay’s T21 (Fig 11b) (where indigo and white ikat stripes alternate with solid indigo stripes), was soon superseded by a similar one with solid green bands interspersing indigo and white chevrons of varying size (Fig 11). Shawls in this style were widely traded throughout the highlands during the first half of this century. They could still be seen occasionally in the 1980’s, despite interim changes of fashion – i.e. the popularity of silk in the 1930’s and ’40’s, the gradual proliferation of multicoloured figural ikat and the predominance of bright acrylic stripes from the 1980’s onward. The use of utility cloths (T22) (Fig 12) is even more widespread than the use of shawls although both items perform the same functions: that of carrying babies or shopping besides being worn as a wrap. 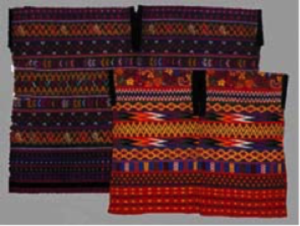 Despite the recent increase of commercial utility cloths (woven on footlooms in the Totonicapán area and traded throughout the Highlands), the majority are still woven on hip-strap looms with designs and colours that conform to the village style. Although Maudslay’s utility cloth cannot be provenanced to any specific village it does have some distinguishing features: 4 selvedged edges, warp stripes, and twin panels sewn together simply without a randa (a decorative embroidered seam). 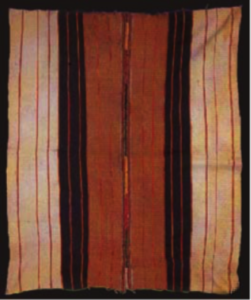 Similar cloths with red, white and natural brown cotton stripes were bought for the Guatemalan Indian Centre collection in the 1970’s from Nahualá and Comitancillo. When tracing the development of huipil T25 from Tecpan (Fig 14), it is intriguing to note that design changes took place at the beginning of the century and then more or less stopped. 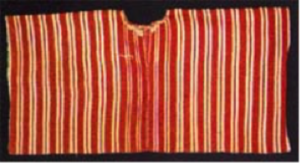 Tecpan over-huipiles (endnote 22) collected in the 1930’s show a shift from checkered brown and white ground to solid natural brown cotton and a greater frequency of the wide red stripes which are flanked by narrow stripes in blue and white as well as yellow. Red and yellow pin stripes appear between the red bands and brocaded zigzags and lozenges decorate the huipiles in exactly the same way as Fig 13, an example from the 1960’s. Today’s huipiles have remained essentially the same, although natural brown cotton has been replaced by dyed cotton, and the close rows of brocaded motifs are worked in cotton, rayon and acrylic rather than silk or wool. Some girls have adopted smaller versions of this huipil for daily wear but its more usual use now is as an over-huipil for cofradia (religious brotherhood) ceremonies. As demonstrated, although Maudslay’s collection of Guatemalan Indian weavings is small, it gives us important information on the materials, dyes and styles used at the end of the nineteenth century. Moreover, by tracing the subsequent development of these textiles, we get an insight into how Maya weaving has evolved over the last hundred years throughout the country as a whole. Now the Cambridge University Museum of Archaeology and Anthropology. Important finds at Chichen Itza; Mayapan; Rio Azul; El Ceren, El Salvador; and Cieneguilla, Chiapas. Reverend Th. Heyde, collected a large number of textiles circa 1895; American Museum of Natural History, New York. 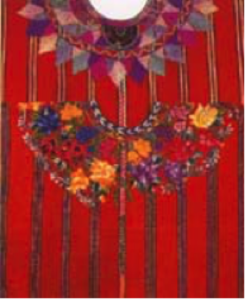 Huipiles (women’s blouses) for commerce are woven on footlooms in Totonicapán, Quetzaltenango and Comalapa, as are blankets and many utility cloths and shawls. Maudslay also collected Mexican and European textiles in Guatemala. 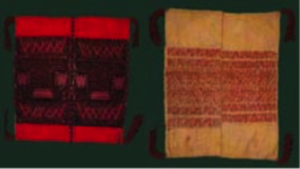 The identifiable Maya weavings are T36 & T39 – women’s basket cloths from Chichicastenango; T31 & T326 male (or saint’s) head cloths from Chichicastenango; T33 & T34 – 2 panels of a San Martín Jilotepeque or San Antonio Aguas Calientes huipil; T23 – huipil from Patzun; T25 – huipil from Tecpan; T24 & T27 women’stzutes (utility cloths or wraps) from Sololá; T21 – shawl from Salcajá. Variously striped tzutes as T22 and sashes as T29 were, and still are, used in many villages, so cannot be positively identified. La Farge 1925 and 1927; Mathilda Geddings Gray 1935, at MARI Tulane. According to the owner’s son, Hiladuras Centroamericanas began producing acrylic thread in 1962. “The Dyes used in Guatemalan Textiles: A Diachronic Approach” by Robert Carlsen and David Wenger in “Textile Traditions of Mesoamerica and the Andes.” Edited by Margot Blum Schevill, Janet Catherine Berlo, and Edward B. Dwyer. Garland publishing, New York and London 1991. La Farge and Gray collections 1925-1935, Tulane University and McDougall’s 1929-31 collection, Pitt Rivers Museum, Oxford. Crocker’s watercolours published in 1952 show both styles in use. Tzut 3-52 and child’s blouse 3-155 constructed from a head tzut. Schevill, Margot Blum 1985. Evolution in Textile Design from the Highlands of Guatemala, Occasional Paper Number 1, University of California, Berkeley. July 1945 and October 1947 issues. Wood, Josephine and Lilly de Jongh Osborne 1966. Indian Costumes of Guatemala, Akademische Druck -u. Verlagsanstalt, Graz. Austria; also Tulane University collection 1925. Three types of huipiles used to exist in Tecpan: a simple ‘house’ huipil, the brownover-huipil for going out and a 3 panelled cofradia (religious brotherhood) huipil. All photographs related to this article and textiles are © / property of The Guatemalan Indian Centre unless otherwise stated as belonging to the Victoria & Albert Museum.